Lionel Messi has won the Golden Ball following his inspirational performances for Argentina at World Cup 2014. The Barcelona attacker was on the losing side in Sunday's tournament decider, with the Albiceleste going down 1-0 to Germany after extra-time in Rio de Janeiro. However, Messi has been rewarded for carrying his side to the final, with the 27-year-old having racked up four goals and one assist in seven appearances. Thomas Muller, who won the Golden Boot in South Africa four years go, picked up the Silver Ball after another sensational tournament for Germany. The 24-year-old attacking midfielder took his overall World Cup goals tally to 10 after netting five times in Brazil - and also ended with three assists to his name. Meanwhile, Netherlands winger took the bronze after playing a key role in Netherlands' third-place finish with three goals and one assist to his name. The other Golden Ball contenders were Germany trio Philipp Lahm, Mats Hummels and Toni Kroos, Argentina duo Javier Mascherano and Angel di Maria, Colombia sensation Arjen Robben and Brazil forward Neymar. 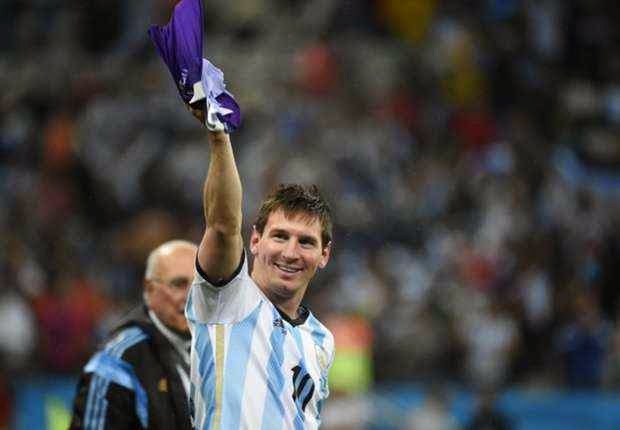 In claiming the prestigious prize, Messi emulates the achievement of the man with whom he is so often compared, compatriot Diego Maradona, who skippered the Albiceleste to success in Mexico in 1986. Messi is the third Argentine to receive the Golden Ball, with Mario Kempes having become the inaugural winner in 1978 on the back of his sensational goalscoring exploits during the country's victorious campaign on home soil. Meanwhile, Paul Pogba picked up the Young Player Award, beating off competition from France team-mate Raphael Varane and Netherlands attacker Memphis Depay.